Tea comes in many varieties, including red tea and green tea. Technically, to be classified tea it must come from the Camellia sinensis plant. However, several drinks people call tea, including red tea, do not come from this plant. How the plant is grown, harvested and processed will give the tea its characteristics. Many purported health benefits are associated with both red and green tea. According to the "Encyclopedia of Natural Medicine," green tea contains epigallocatechin, a form of antioxidants. Red tea, on the other hand, does not contain epigallocatechin, but contains super oxide dismutase, another form of antioxidants. Therefore, both teas have antioxidant properties but derive these properties from different substances. Tannin is an astringent in both green and red teas. Green tea has a higher tannin content than red tea. This higher tannin content gives green tea a more bitter taste than red tea. Green tea comes from the mature tea leaves of the Camellia sinensis plant. Green tea is unoxidized and unwilted. Green tea has many health benefits that have been confirmed through scientific study. According to Harvard Health Publications, green tea offers antioxidant benefits, reduced risk of hypertension and reduced risk of certain types of cancers including colon, breast, skin and lung. Green tea does contain caffeine. The exact amount of caffeine in green tea will depend on the specific variety you drink. According to MayoClinic.com, Stash Premium Green tea contains 26 mg of caffeine per 6-oz. serving. This is a relatively low amount of caffeine compared to black tea, which averages 40 to 120 mg of caffeine per 8-oz. serving, and coffee, which contains 95 to 200 mg per 8-oz. serving. Red tea does not contain any caffeine. Red tea is not technically a tea because it does not come from Camellia sinensis plant. Red tea comes from a a shrub that is a member of the legume family and is indigenous to the Cedarberg Mountains in South Africa. 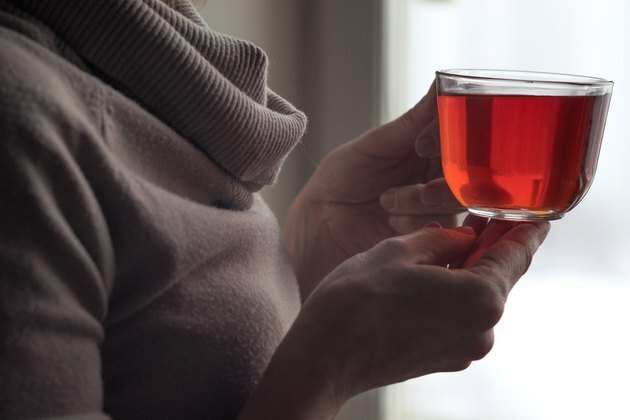 According to the "Encyclopedia of Natural Medicine," red tea is not as bitter as green tea. Red tea also offers many of the same health benefits associated with green tea, including antioxidant and cancer fighting properties.